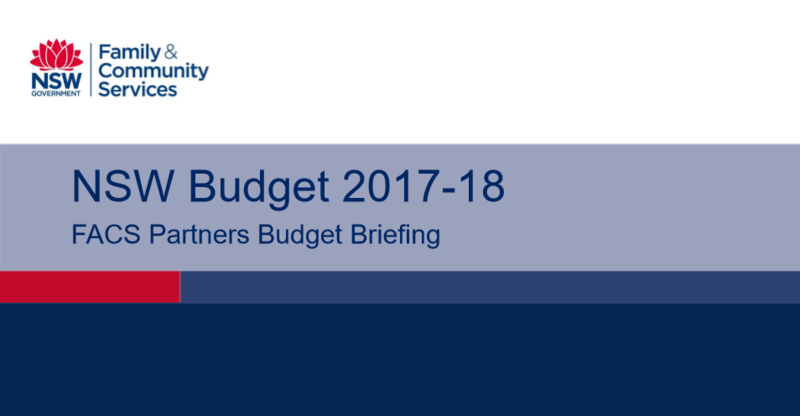 WSCF attended the New South Wales Department of Family and Community Services (FACS) 2017-2018 Budget Briefing this week, which unpacked the Budget that was handed down in June, outlining a $7 billion spend for the sector in the next financial year – an increase of $459 million (7.1 %) in funding from the previous year’s budget. $1.9 billion on child protection and out-of-home care services. $2 billion on accommodation and other supports for people with disability to assist them to live with dignity in their communities. $1.1 billion on social housing services and homelessness assistance. $1.4 billion on supporting people with disability to participate socially and economically in their community. Homelessness – $12 million to expand the Premier’s Youth Homelessness Initiative; an additional $20 million over four years to provide more transitional accommodation and support packages for rough sleepers. Early intervention – $148 million over four years in new spending to support children with high needs in out-of-home care. Domestic and family violence – $10 million for pilot behaviour change interventions for high risk offenders. The full FACS Budget breakdown and objectives are available to view here.